Image caption The rebels accused the Iranians of coming to Syria to "serve the regime"
Forty-eight Iranians held hostage by rebel fighters in Syria since August have been freed. They were released in exchange for 2,130 prisoners held by the Syrian authorities, a Turkish charity said. 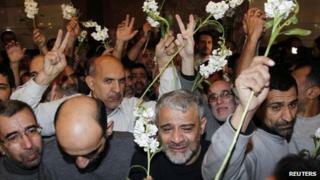 The rebels claimed the Iranians had been assisting the Syrian military, but Iran insisted they were Shia pilgrims. Meanwhile, UN envoy Lakhdar Brahimi has said President Bashar al-Assad's speech on Sunday was a "lost opportunity" to resolve the crisis in Syria. Mr Brahimi told the BBC that the address had called for a repeat of previous initiatives which had not worked, and had been sectarian and one-sided. Mr Assad called on Syrians to fight the "murderous criminals" he claimed were responsible for the violence. "What you need is reaching out and recognising that there is... a very serious problem between Syrians, and that Syrians have got to talk to one another to solve it," Mr Brahimi added. The release of the Iranian hostages earlier on Wednesday came after months of diplomatic efforts which reportedly involved Qatar, Turkey and the Turkish Islamic aid agency, the Humanitarian Relief Foundation (IHH). The 48 men were taken to the Sheraton hotel in the Syrian capital, Damascus, where they would be received by the Iranian ambassador, Iranian sources told BBC Arabic. After that, they would be flown to Tehran, the sources added. The Syrian government has not confirmed their release or the swap deal. However, the head of the IHH earlier said 2,130 civilian prisoners would be released by the Syrian authorities in return for the Iranians. "Some of our friends are with the opposition groups and we are heading to the area where the prisoners are to be released," Bulent Yildirim told the Anadolu news agency. "Efforts under the Turkish and Qatari mediation continue, while the exchange started at several locations where prisoners were kept." The released prisoners include 73 women, four Turks and a Palestinian, said a member of the IHH's executive board, Huseyin Oruc. "It is the first time that the humanitarian diplomacy we initiated succeeded in releasing such a large group of people at once," he told the New York Times. "There are many more held captive and our efforts to free them will continue without delay." Turkey and Qatar have supported the 22-month-old uprising against Mr Assad, in which the UN says at least 60,000 people have died. The Iranians were seized by Free Syrian Army's al-Bara Brigade in early August. The brigade later released a video of the hostage and claimed it had evidence showing that the group belonged to the Iranian Revolutionary Guards and had come to Syria to "serve the regime". The Iranian government rejected the allegations, insisting the men had been visiting the Sayyida Zainab shrine south of Damascus when they were abducted. An official at the Iranian Pilgrimage and Travel Organisation said the group included university students and some public servants. The men were all civilians, he added. However, Iran's foreign minister said a number were retired Revolutionary Guards and soldiers "dispatched to Syria to make a pilgrimage". In October, the al-Bara Brigade threatened to start killing the Iranians unless Syrian government forces freed opposition detainees and stopped shelling civilian areas. But Qatar urged the rebels not to do so. Mr Brahimi will meet top US and Russian diplomats in Geneva on Friday in an effort to advance the peace plan outlined by the Action Group for Syria, Russia's Interfax news agency reports, citing the country's Deputy Foreign Minister, Mikhail Bogdanov. The Action Group for Syria called in June for an immediate cessation of violence and the establishment of a transitional government that could include officials serving under President Assad and members of the opposition. In his interview with the BBC, Mr Brahimi admitted that the positions of the government and the opposition meant that, at the moment, there was no political process. He said he would now focus on resolving differences between the main outside actors, and try to work from the outside to try to bring Syrians to accept there could only be a political solution. The Algerian diplomat also confirmed reports that Mr Assad had told him when they last met on 24 December that he hoped to run in the next presidential election scheduled for 2014. However, Mr Brahimi said this was too far away and that people believed one family ruling a country for 40 years was "a little bit too long".